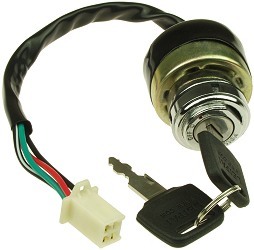 Browse for key switches by vehicle make and model. 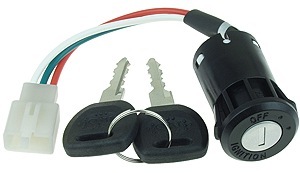 Electric scooter and bike key switch with 2 wires and 2 keys. Two position off-on key switch. Key removable in off position only. 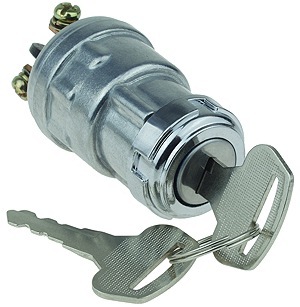 Universal size key switch fits virtually all electric scooters, bikes, and go karts with metal key switches. 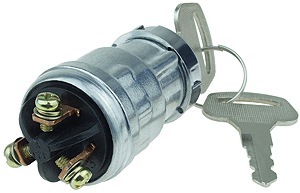 All 2 wire key switches are interchangeable with each other regardless of their wire colors. Electric scooter and bike key switch with 3 wires and 2 keys. Three position off-on-on key switch. Key removable in off position only. 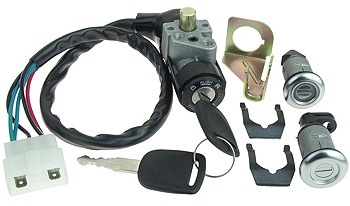 Universal size key switch fits virtually all electric scooters, bikes, and go karts with metal key switches. Electric scooter and bike key switch with 4 wires and 2 keys. Two position off-on key switch. Key removable in off position only. 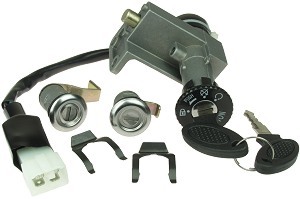 Universal size key switch fits virtually all electric scooters, bikes, and go karts with metal key switches. 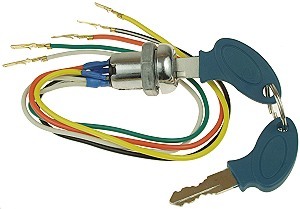 Electric scooter and bike key switch with 5 wires and 2 keys. Three position off-on-on key switch. Key removable in off position only. 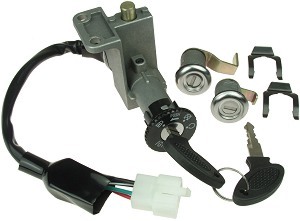 Universal size key switch fits virtually all electric scooters, bikes, and go karts with metal key switches. Key switch with 3 terminals and 2 keys. Two position off-on key switch. Key removable in off position only. Fits many electric go-karts, ATVs, UTVs, quads, mopeds, and dune buggies. 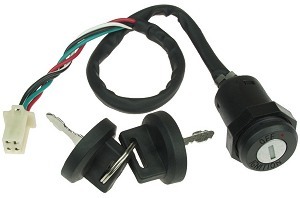 Electric ATV key switch with 4 wires and 2 keys. Two position off-on key switch. Key removable in off position only. Fits the X-Treme XA-1000 electric ATV / Quad plus other electric dirt bikes, quads, and ATVs. Plastic mounting plate for metal key switch and battery indicator gauge. Works with both 2 position and 3 position key switches. 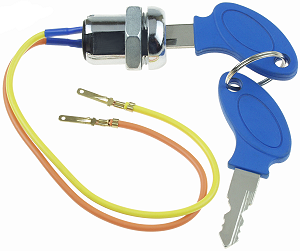 Electric scooter and bike key switch with 2 wires and 2 keys. Two position off-on key switch. Key removable in off position only. 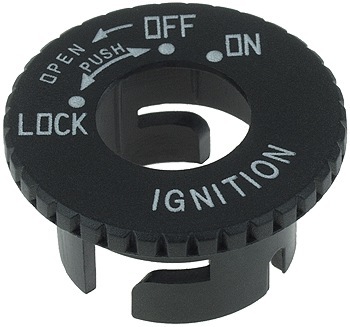 This key switch has a tab with a hole in it for screw mounting to inside on instrument cluster or scooter body. 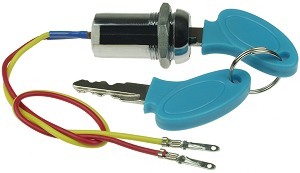 Electric scooter and bike key switch with 4 wires and 2 keys. Two position off-on key switch. Key removable in off position only. This key switch has a tab with a hole in it for screw mounting to inside of instrument cluster or scooter body. Electric scooter and bike key switch with 3 wires and 2 keys. Three position off-on-on key switch. Key removable in off position only. This key switch has a tab with a hole in it for screw mounting to inside of instrument cluster or scooter body. Electric scooter and bike key switch with 3 wires and 2 keys. Three position off-on-on key switch. Key removable in off position only. Position 1 is for scooter on with lights off, and position 2 is for scooter on with lights on. This key switch has tabs that lock the switch into position after it is pushed into the mounting hole. 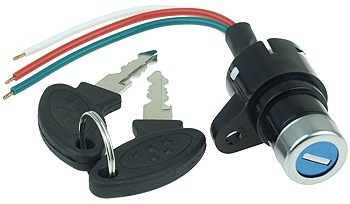 Universal size key switch fits virtually all electric scooters, bikes, and go karts with plastic key switches. 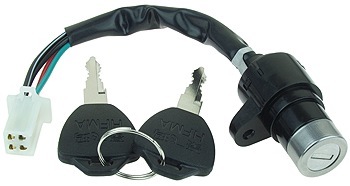 Electric scooter and bike key switch with 2 wires and 2 keys. Two position off-on key switch. Key removable in off position only. This key switch has plastic spring tabs that lock the switch into position after it is pushed into the mounting hole. 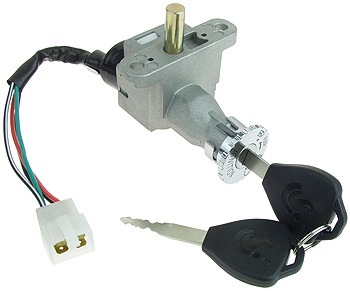 Universal size key switch fits virtually all electric scooters, bikes, and go karts with plastic key switches. Electric scooter and bike key switch with 4 wires and 2 keys. Two position off-on key switch. Key removable in off position only. 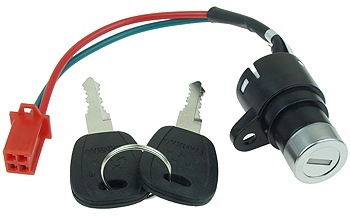 Universal size key switch fits virtually all electric scooters, bikes, and go karts with plastic key switches. 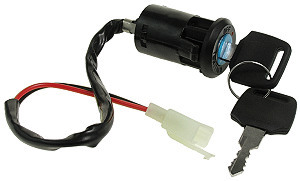 Electric ATV, Quad, scooter, and bike key switch with 4 wires and 2 keys. Two position off-on key switch. Key removable in off position only. 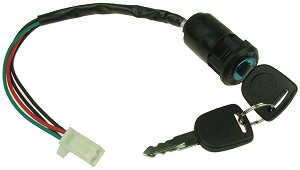 Universal size key switch fits virtually all electric scooters, bikes, and go karts with plastic key switches. 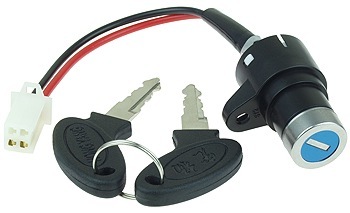 Electric scooter, moped, and bike key switch with 2 wires and 2 keys. Three position locked-off-on key switch. Key removable in locked and off position. 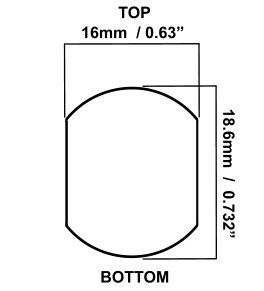 17.5mm center to center distance between mounting holes. 10mm round lock pin. Lock pin protrudes 12mm in unlocked position and 18mm in locked position. 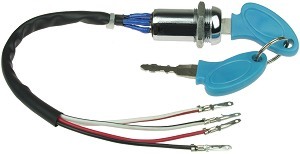 Electric scooter, moped, and bike key switch with 5 wires and 2 keys. Includes seat and trunk lock with mounting hardware. Three position locked-off-on key switch. Key removable in locked and off position. 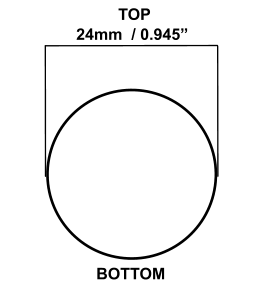 17.5mm center to center distance between mounting holes. 10mm round lock pin. Lock pin protrudes 4mm in unlocked position and 11mm in locked position. Electric scooter, moped, and bike key switch with 2 wires and 2 keys. 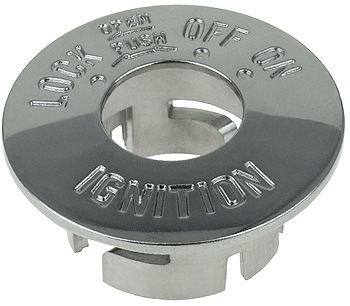 Three position locked-off-on key switch. Key removable in locked and off position. 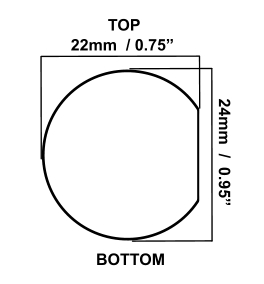 17.5mm center to center distance between mounting holes. 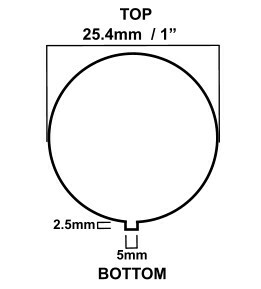 10mm diameter round lock pin. Lock pin protrudes 8.5mm in unlocked position and 16mm in locked position. Front plastic bezel is removable for through hole installation. Electric scooter, moped, and bike key switch with 2 wires and 2 keys. Three position locked-off-on key switch. Key removable in locked and off position. 17.5mm center to center distance between mounting holes. 10mm diameter round lock pin. Lock pin protrudes 8.5mm in unlocked position and 16mm in locked position. Front bezel is removable for through hole installation. 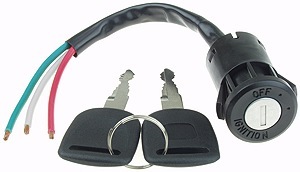 Electric scooter, moped, and bike key switch with 2 wires and 2 keys. Three position locked-off-on key switch. Key removable in locked and off position. 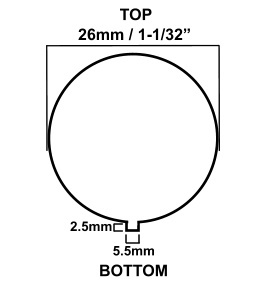 59mm center to center distance between mounting holes. 10mm diameter round lock pin. Lock pin protrudes 15mm in unlocked position and 25mm in locked position. Front bezel is removable for through hole installation. Key switch with two keys for full size street legal electric scooters, bikes, and mopeds. Three position locked-off-on key switch. Key removable in locked and off position. 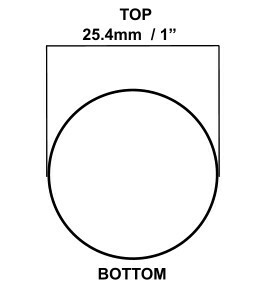 50mm center to center distance between mounting holes. Front black plastic bezel is removable for installation. Key switch plus two trunk/panel locks with two keys for full size street legal electric scooters, bikes, and mopeds. 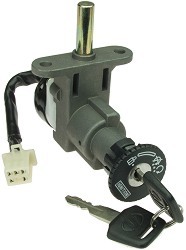 Three position locked-off-on key switch. Key removable in locked and off position. 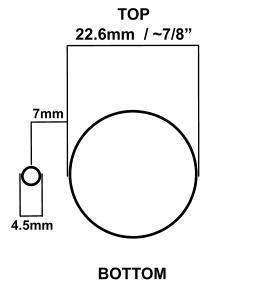 28mm center to center distance between mounting holes. Front black plastic bezel is removable for installation. 10mm round lock pin. Lock pin protrudes 2mm in unlocked position and 9mm in locked position. Electric scooter, moped, and bike black plastic key switch cover bezel. Electric scooter, moped, and bike chrome-plated aluminum key switch cover bezel. 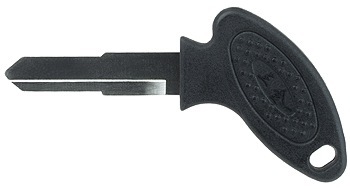 Electric scooter, moped, and bike key blank with black plastic handle. Key style "A" with grooves on top left and bottom right sides of the blade. 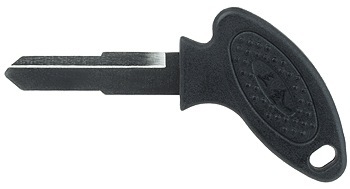 Electric scooter, moped, and bike key blank with black plastic handle. Key style "B" with grooves on top right and bottom left sides of the blade. 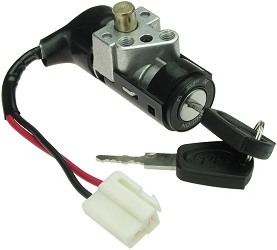 We carry key switches and key blanks for many different models of electric scooters, electric mopeds, electric motorcycles, electric bicycles, electric tricycles, electric quadracycles, electric dirt bikes, electric pocket bikes, electric sports bikes, electric go karts, electric ATVs, electric UTVs, electric quads, electric golf carts, electric beach wagons, and other types of small and lightweight electric vehicles.